Do you want to make a SWOT analysis of your company or project? Download this strategic SWOT with detailed and global matrix template for Excel now! We provide this professional Excel spreadsheet SWOT analysis, including 2 different kinds of SWOT matrices and an extensive list of Strengths, Weaknesses, Opportunities, and Threats. The SWOT matrix (2X2) can be useful to compile a strategic planning. downtime and slow systems and processes. more suppliers on the market. the strengths and weaknesses internal to the organization. the opportunities and threats presented by the external environment to the organization. This improved SWOT analysis template will grab your colleagues, employees or boss' attention. Every other essential aspect of strategic SWOT analysis in this spreadsheets are covered. After downloading and filling in the blanks, you can customize every detail and appearance of your SWOT and finish in minutes. 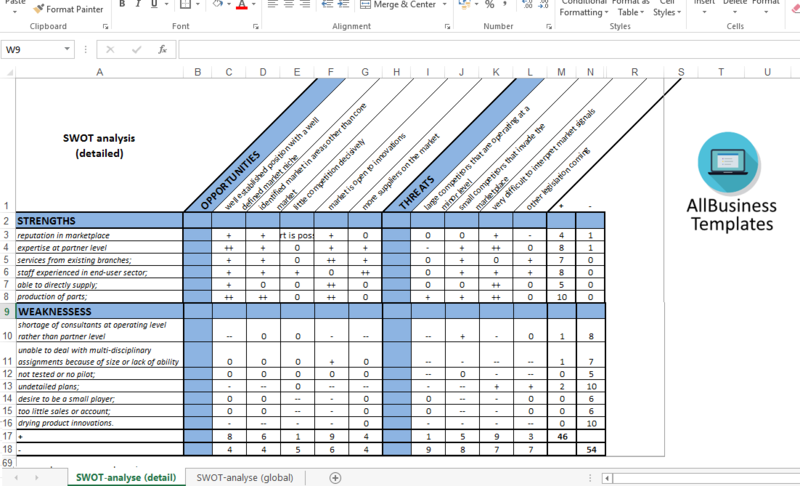 Download this SWOT Analysis Excel Template now!